It’s no secret that as humans we like to exercise our freedom of choice. Having choice is important as it helps us to express our identity and allows us to consume what we like according to our personal preferences. Whether it’s selecting what to wear, deciding what television show to watch, or choosing what to do over the weekend – we strive to be authors of our own destiny. On the flip side, I’m sure you can recall a time when you had too many choices, so many, in fact, that it was almost debilitating. Perhaps you were unsure of what topping to get on your pizza? Or maybe you were so overwhelmed by choice of ice cream flavours that you defaulted to simply vanilla? Known as the “choice paradox”, this fear of making the ‘wrong choice’ or missing out on the ‘better option’ – is the brain’s response to having too many choices. In 1995, Professor Shena Iyengar from Columbia University put the concept of “too much choice” to the test. As part of her experiment, she opened a market stall that offered jam samples. Every few hours she would alternate between offering twenty-four choices of jam to just six choices of jam. Throughout the day, it was obvious that more people visited the stall when more jams were on display. Interestingly, however, it was during times when fewer jams were on display that customers actually converted their browsing into purchasing. 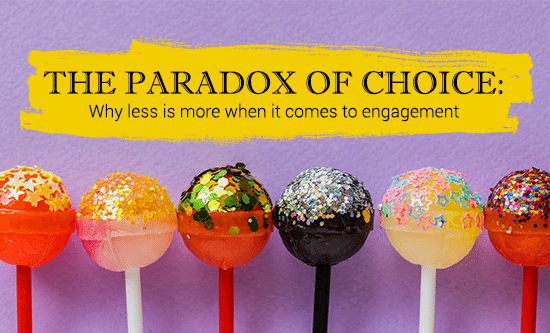 Concluded was that while choice might be appealing in theory, in reality many people actually find too much choice overwhelming. 1. Analysis Paralysis: When there are too many options, customers will become paralysed and instead purchase nothing. Whirlpool recently tested this via an email marketing campaign. By significantly reducing the number of products advertised, Whirlpool saw engagement with their advertisement rise by a whopping 42%. 2. Buyers’ remorse: After browsing for hours and then finally settling on a product, many customers will experience a sudden pang of guilt. This is a reflection of them second-guessing whether they’ve made the right choice. 3. Decision fatigue: Put simply, we each have the energy to make a finite number of decisions each day. Once we’ve reached that limit, our ability to make smart decisions (or any decision at all) is severely depleted. Of course, choice does have positive benefits that must not be forgotten. With choice comes a wider audience and the ability to appeal to a more diverse customer base. This may in turn help brands grow and give customers the feeling of being empowered in their decision making. 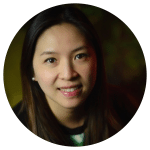 By Kitty Shui, Data-driven Strategy Specialist at Digital Alchemy.